Red Bull New York announced today that it has acquired defender and U.S. National Team veteran Chris Albright from the New England Revolution in exchange for a 2010 MLS SuperDraft second round pick (31st overall) and third round pick 48th overall). The Red Bulls still hold five picks in today's SuperDraft; two in the first round (2nd, 14th), one in the second (18th), one in the third (34th) and one in the fourth (50th). "We consider that Chris has the potential to again be one of the top right backs in MLS. His resume of winning three MLS Cups and playing for the U.S. National Team speaks for itself and we are confident that he can provide leadership and ability to our back line," said Red Bull New York Sporting Director and General Manager Erik Soler. Albright, who was acquired by the Revolution on Jan. 18, 2008 from the Los Angeles Galaxy in exchange for allocation money, is an experienced veteran in Major League Soccer, winning three MLS Cup titles with D.C. United in 1999 and the Galaxy in 2002 and 2005. In 2009, the three-time MLS All-Star started in one game in April before missing the rest of the season due to left knee injuries. Albright underwent meniscus surgery on April 22. In his first year for New England, Albright set new career highs by starting and appearing in 26 of 30 games. The 30-year-old made 32 appearances in all competitions and helped New England win the 2008 SuperLiga, scoring the winning penalty kick. Prior to joining New England, Albright spent six seasons with Los Angeles, accumulating seven goals and 18 assists in 111 regular season appearances. While with the Galaxy, Albright, who has earned 22 caps for the U.S. National Team, was selected for the 2006 FIFA World Cup squad. The Galaxy acquired the Philadelphia, PA native and a second-round selection (24th overall) in the 2002 MLS SuperDraft from D.C. United in exchange for Los Angeles' first and second round 2002 MLS SuperDraft picks and a 2003 conditional SuperDraft pick. 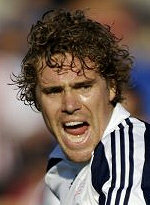 Albright started his MLS career with D.C. United in 1999 and made 56 appearances over three seasons. After he was allocated to the Miami Fusion as a Nike Project-40 player, he was traded, along with John Maessner, to United for Brian Kamler. Albright attended the University of Virginia between 1997-98.